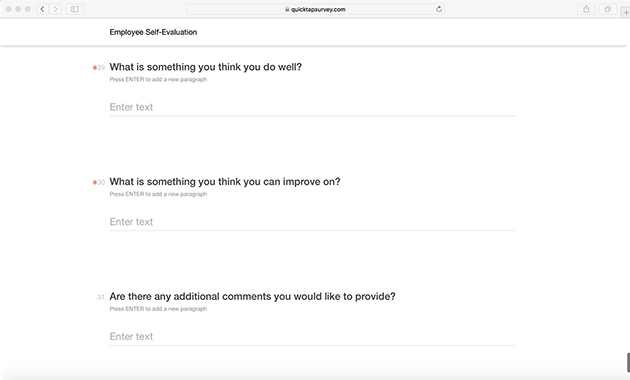 An employee self evaluation is a great way to encourage more involvement from your staff in their performance evaluation. It also encourages career planning and goal setting amongst your employees. 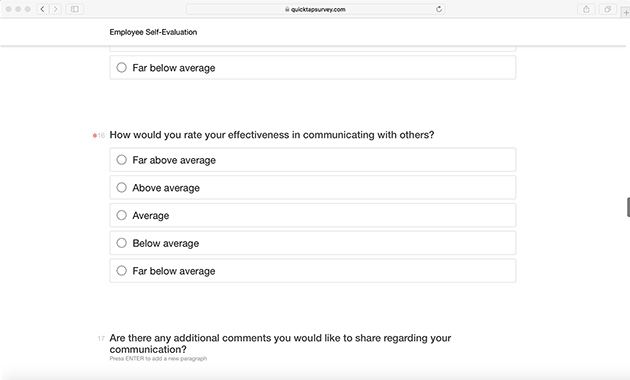 This survey template can be used to develop a more comprehensive review process to improve performance and set realistic standards. 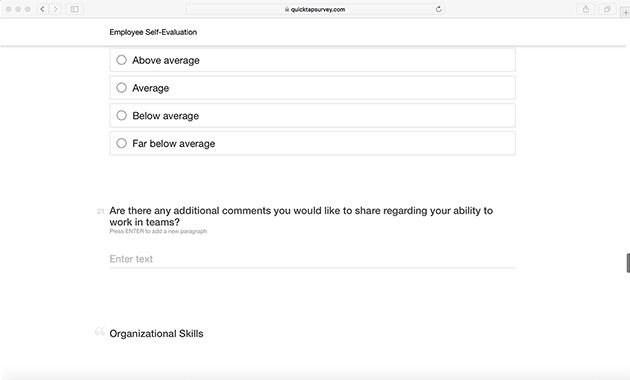 The QuickTapSurvey app is a great way to build and launch your own employee self evaluation survey. 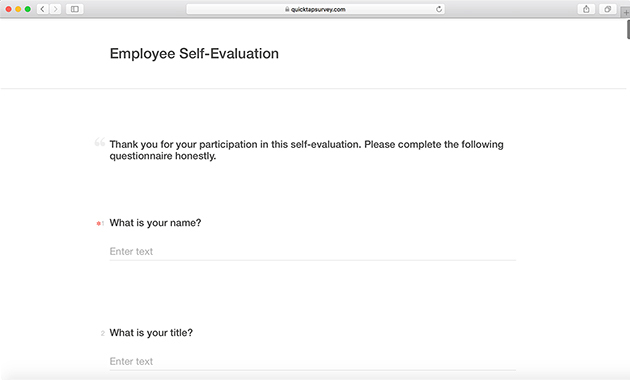 Build your survey from scratch or start with this prebuilt employee self evaluation template! Capture data face-to-face, with a kiosk, or offline. How well do you believe you handle pressure? How often do you believe you display ethical behaviour? How would you rate your ability to acknowledge and learn from your mistakes? Do you display dedication to the customer or client? 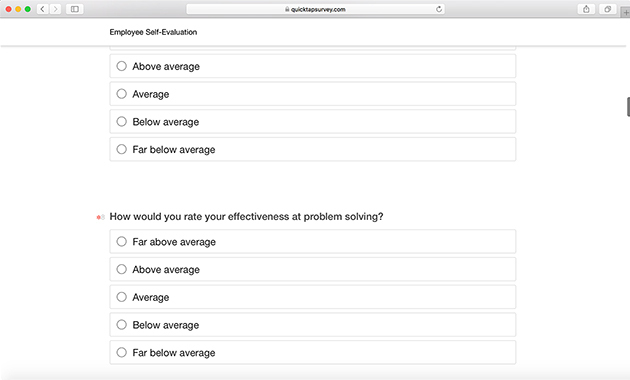 How would you rate your effectiveness at problem solving? How would you rate your effectiveness at conflict resolution? How would you rate your ability to motivate others? How would you rate your passion towards the company vision? How would you rate your willingness to take initiative? 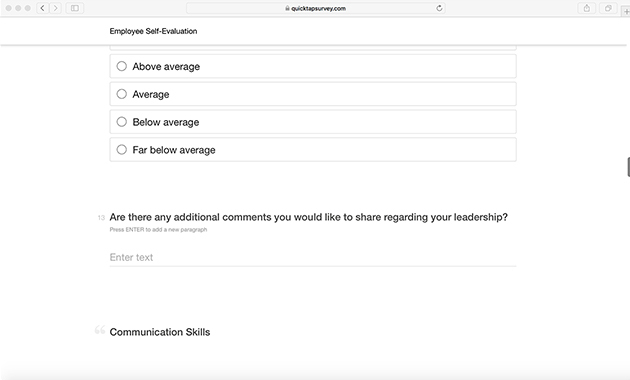 Are there any additional comments you would like to share regarding your leadership? 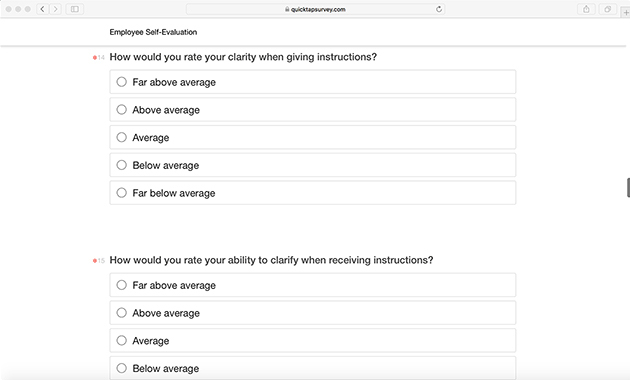 How would you rate your clarity when giving instructions? How would you rate your ability to clarify when receiving instructions? 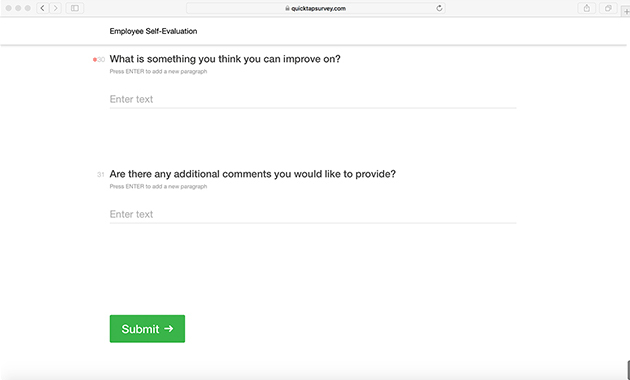 How would you rate your effectiveness in communicating with others? 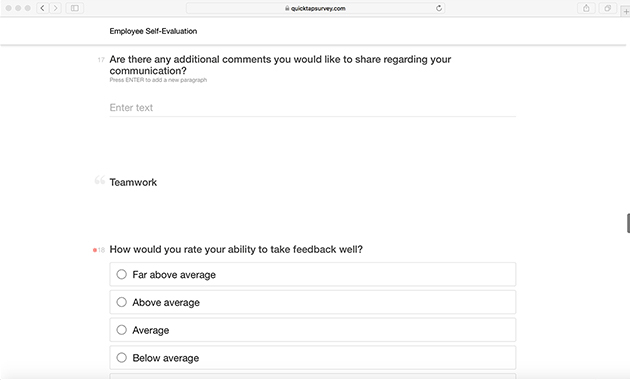 How would you rate your ability to take feedback well? How well do you believe you demonstrate respectful treatment of others? How well do you believe you work in a team setting? How would you rate your response to a change in priorities or deadlines? 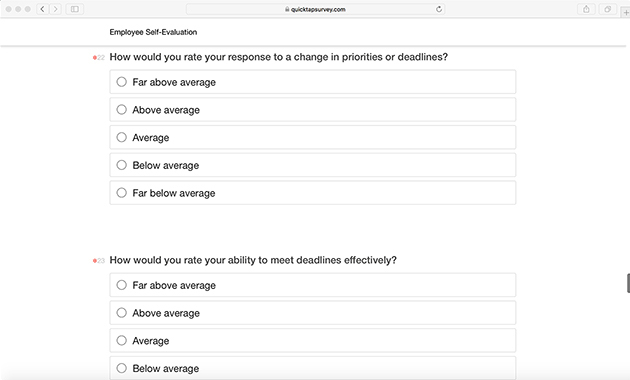 How would you rate your ability to meet deadlines effectively? How would you rate your ability to work independently? How would you rate your ability to plan accordingly for multiple tasks? 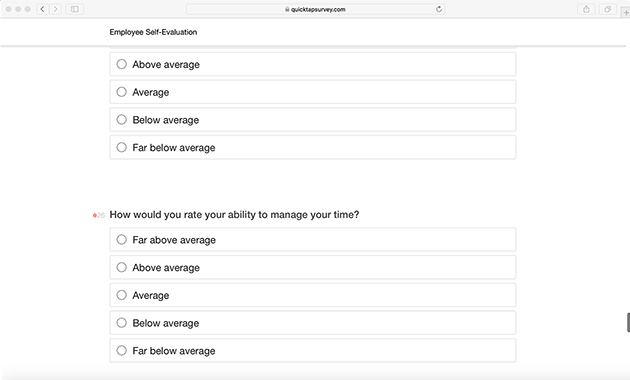 How would you rate your ability to manage your time? How do you believe you contribute to the ability of others to do their jobs well? What is something you think you do well? What is something you think you can improve on?